It's good to be back in the tennis seat and there's no better place to be in July than Florida, where I can cover four of the USTA National Clay Court Championships -- Boys' 18, Boys' 16, Boys' 14 and Girls' 12 -- within an hour of my Delray Beach base. I didn't waste anytime and was out at the courts within an hour of my flight arrival. The first day at any tournament is a bit of an adjustment and it's been awhile since I've covered junior tennis. I was getting started in the late afternoon and there were still main draw matches at the Boys' 16s main site, Broken Sound Country Club. I headed over to Boca Raton in time to watch a player I've seen since at tournaments since he was just getting started. Fifteen year old New Yorker Noah Rubin has grown about two feet since I've last seen him and he needed that extra muscle to get past Chase Perez-Blanco (left). The Floridian put up quite a fight and the crowd enjoyed some great points before third-seeded Noah moved on with a 6-4,7-6 win. Speaking of height, there was probably a two feet difference between Baker Newman and Alex Gianini (below), though Baker didn't let that become a disadvantage on the court. He held tough out there and added a 7-5,6-2 win to his record to go with the upset he had over No. 13 Edward Covalschi yesterday. Before I called it a day, I caught the first set of another good one, No. 16 Tyler Gardiner vs. Samuel Lampman (below). The ball was in constant play as the two players ran each other around the court. Tyler did prevail 6-4, and moved on with the same score in the next set. At the end of the day, there were a number of upsets upsets at the Boys' 16s draw: Philip Antohi took out No. 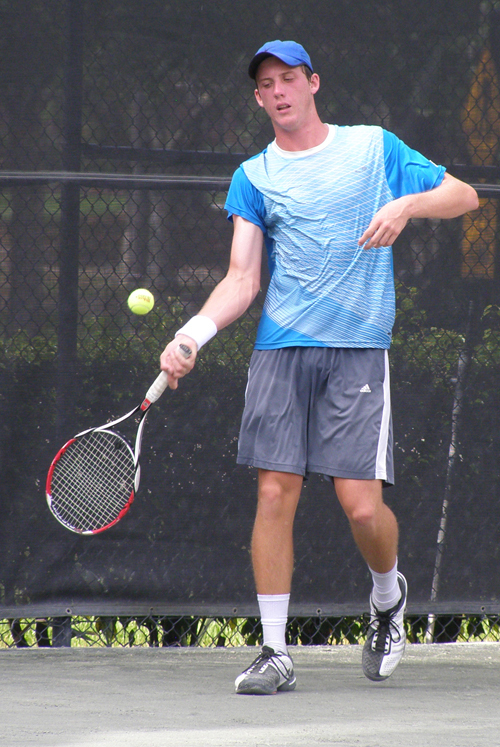 6 JC Aragone, 6-0,7-6; Will Showers beat Christopher Vrabel (17-32), 7-5,6-4; Samuel Shropshire (17-32) lost to Paul Oosterban, 6-3,6-2; Jared Donaldson won over No. 5 Gregory Garcia, 6-2,6-3; Drew Dawson (17-32) fell to Daniel O'Connor, 6-1,6-2; and Jake Albo took out Cirro Ricardi (17-32) , 6-1,6-4. The final upset of the day was the biggest and I'm really sorry I missed it. I was happy to see the Pura family as it's been a full year since we've caught up in person. Unfortunately, my 4:00 am wake up call didn't leave me with enough stamina to stick around for the night match, where second seeded Thomas (TJ) Pura fell to Tyler Lu, 6-4,3-6,6-2. I'm heading to Fort Lauderdale on Wednesday to the Jimmy Evert Tennis Center, where my good friend Susan Krowitz is running the Boys' 14 Claycourts .